Passports: Lives in Transit conceives of passports as the ruins of a modern dream now in terminal crisis – the dream of a globalized world. Drawing on the collections of Harvard Library, the exhibition addresses this major contemporary issue through the lens of passports, visa applications, and other documents associated with noteworthy nineteenth- and twentieth-century travelers, émigrés and refugees, including George Train, Leon Trotsky, Gertrude Neumark Rothschild, and Shirley Graham Du Bois. Also on view, items of personal significance to a Harvard student telling the story of his late mother’s immigration to the U.S. and how this experienced forever marked her life, as well as a site-specific multimedia art installation of used passports purchased on e-commerce sites, further underscore the exhibition’s engagement with current geopolitics and activism. 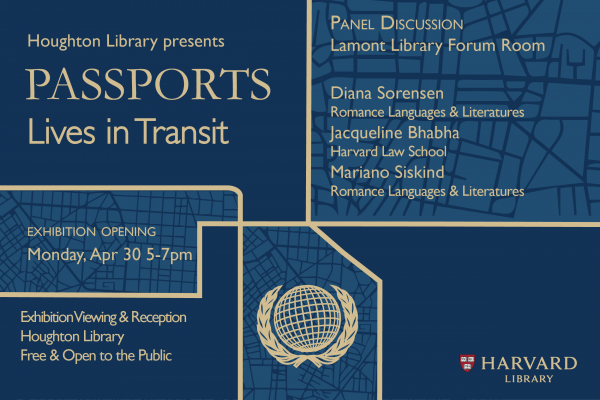 Passports was co-curated by Rodrigo del Rio and Lucas Mertehikian, both doctoral students in Harvard University’s department of Romance Languages and Literatures.